An Essex CT Wedding Photographer can take gorgeous pictures on the shore of the Connecticut River. 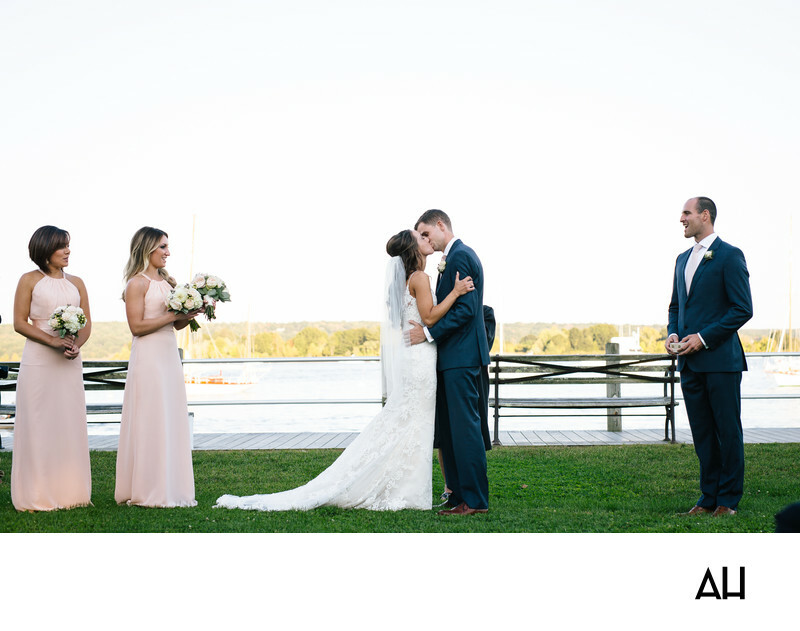 At the Essex Yacht Club, couples and their bridal parties have access to pristine water views that will give their day a feeling of tranquility. In this image, the bridal party stands with the newlyweds as they say, “I do”. The scenery behind the group is dream-like, giving the moment a mystical air. The water is clear and the opposite shore is lined with trees in varying shades of green. Boats float in the crystal water, rocked by gentle waves. The sunlight shining down on the blessed event makes the background glow and the colors of the river, trees, and sky run into one another like images in a watercolor painting. The bride is stunning in this moment, wearing a romantic lace gown. Her hair and veil trail down her back as she tips her face up to receive a kiss from her husband. The best man and the bridesmaids cheer at the joining of these two wonderful people. The best man’s attire matches that of the groom, a navy suit with a pale tie. The bridesmaids wear pale pink dresses and hold lightly colored flowers. These neutral colors stand out against the bold green of the lawn. It is a picture perfect moment, showcasing the love between the couple and the happiness of the bridal party.